The Geeky Rabbit: Etude House Sweet Recipe goodies! The Etude House Sweet Recipe collection is now out, and I picked up some goodies! Most of the items are already released but a few products, such as the chocolate eyeshadow, has not been stocked. I'm very excited for the collection, but I didn't pick up as many items as the Princess Etoinette collection. The above pic is actually a cute tin that came along with my purchases. First up is the Sweet Recipe Candy stick. It's more of a lip crayon/ lip balm. The color is very sheer. There's 3 shades and flavors (yellow, pink, orange) and I picked up the color 2 (orange). Very light shade of tangerine, so it doesn't look too loud. It smells delicious too! The color applies much sheerer than it looks in the tube. The crayon can be twisted back into the tube. The packaging is way too cute! Shaped like a candy cane, and the cap pops off to reveal the balm. Very easy to use! The item that I love most is the Sweet Recipe Chocolate Highlighter. It's a beige-y highlighter and has three tones. Check out the print on the "chocolate" bricks! The color is very sheer as well, and it's great for an all-over shimmer. I must say that this one is slightly less shimmery compared to my Princess Etoinette highlighter. This provides a very natural finish and is great for everyday wear. I think it makes a pretty good eyeshadow too, for a light wash of shimmer on the lids. Or a lil' dab at the inner corner of the eyes for a doe-eyed look. The packaging is a slide-out pan (just like chocs!) and the packaging is completely made of cardboard. The palette's supposed to resemble white chocolate, so the colors are pretty light! As shown previously, I got a metal tin as a gift with purchase. It's such a cute tin! Great for stashing little trinkets. 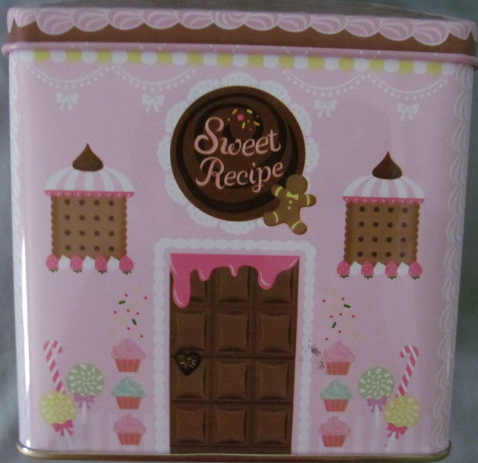 It has chocolate, cupcakes, candy canes and lollipops all over the tin. Even the inside has the cute motifs! Too cute! It's actually a bright pink tone but it doesn't photograph well due to the shadows. The color scheme inside is the signature Etude House colors. The official campaign pic from the brand as above. Loving the collection, and I'm definitely looking forward to get more items once the complete series is available!